The FOMC meets this week and is expected to deliver a rate increase. Wednesday’s announcement will be associated with a summary of economic projections and a press conference by the Chair. The return on cash hasn’t been much to write home about recently. As the economy picks up, expectations for short-term interest rates are perking up (graph below). 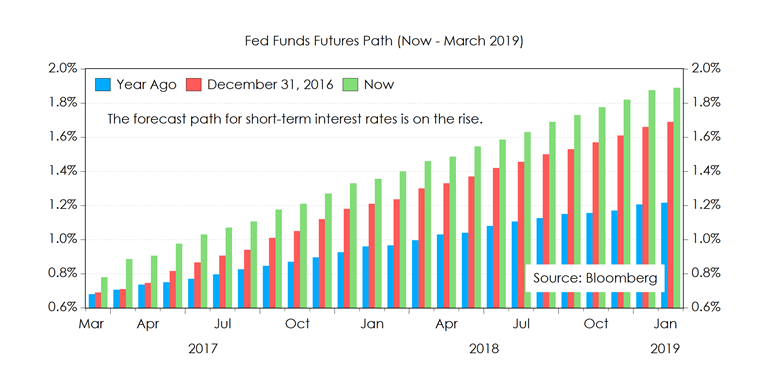 A year ago, markets were pricing in an expectation for a 1.2% short-term interest rate by early 2019. Today, that same expectation is near 1.9%. 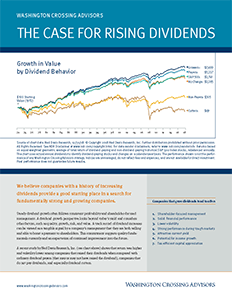 As assumed cash returns rise, they compete against returns available on other assets. The Federal Reserve’s Federal Open Market Committee (FOMC) meets again this week. A rate increase seems justified given the current degree of accommodation, increasing price pressures, and strong employment readings. Headline inflation is up 2.5% year over year, above the Fed’s 2% target rate, for example, while the 4.7% February unemployment rate is now below the Fed’s assumed “full employment” level. Even average hourly earnings are accelerating and likely to near a 2.5% pace in the first quarter. 2) Monthly employment growth is near 180,000 net new jobs, which is much higher than monthly labor force growth (75,000 – 125,000). Less accommodative monetary policy also comes amid shifting expectations for fiscal policy, complicating matters. 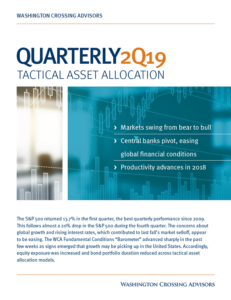 With slack in the economy abating, and potential for a fiscal thrust on the horizon, the job of the central bank is further complicated. After a long period of ultra-low interest rates, the pace of increases is clearly picking up along with the economy.